Are you looking for a fun and creative program for your organization? Novaks Flower Shoppe Staff will come out to your organization and teach your group to make a beautiful floral arrangement, centerpiece, wreath and much more! Pick a theme and we'll do the rest. Choose a theme appropriate for the time of year, (Halloween, Fall, Thanksgiving Christmas, Spring) Novaks Flower Shoppe will create a smaple to show your group.. We supply the flowers, containers, greens, bows, add ons everything you need to create a unique custome design. Our staff will instruct your group step-by-step, so everyone goes home with a beautiful keepsake arrangement. Give us a head count 2 days prior to the workshop and a final count the day of the workshop. The entire workshop takes about 1 hour plenty of time for you to conduct your meeting or socialize afterwards. Novaks Flower Shop has been conducting workshops for over 20 years. Its a great fundraiser for your group if you choose to add more to the cost. Novaks Flower Shop Workshop fee is $20.00 per person, no other fees apply, The arrangment is valued at $40.00 if you were to purchase it in our store. What a great deal!! The holidays book very quickly especially Thanksgiving and Christmas call our store to reserve your date 216-663-2906. Minimum of 15 people are required for the workshop, we have had groups as large as 125 people we can handle any size. Novaks Flower Shop offers a Thanksgiving, Christmas, and Spring workshop every year at Valley View Community Center if you choose to have your group meet at our location We will reserve your own table at our public event. Look for our arrangement selection coming soon on Facebook. 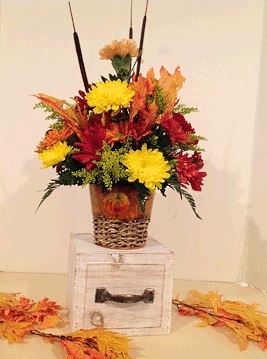 Call today 216-663-2906 for more information and a sample arrangement. Start a tradition with your group that everyone will enjoy for years to come. Become part of the Novaks Flower Shop Workshop Family call today 216-663-2906. Create a Thanksgiving Arrangement Designed in a keepsake container, filled with fall pomps, carnations, cattails and oak leaves. 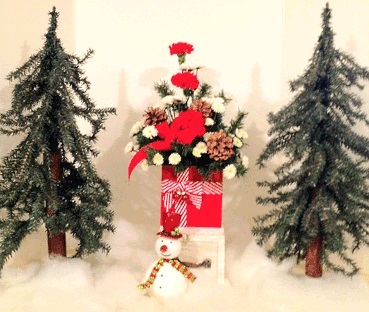 Create a Christmas Arrangement Designed in a Ceramic Gift Box, Filled With Red Carnations, White pomps, Christmas Pine, And Pinecone. Extra Snowman Accent Available upon request.